Release Your Favorite Family Videos Now! Remember everything I said two years ago about organizing and editing all those home video clips you’ve taken with your digital camera? Remember how I calmly talked about how to regularly create your own series of ongoing family videos to share? It’s filled with lots of great video editing strategies. Well if you’re a parent of young children, you can forget about it. I’m back from four years of parenthood, and I’ve got a new report to share from the front. There just simply isn’t the time to do all this. My methodologies work in the lab, but they fall entirely short after real-life testing. And they’ve expired, because nobody cares what my four year old was doing when he was three. I now understand it’s every daddy in the world for himself. Don’t wait to execute your perfectly cohesive plan before distributing your great video moment. Just get the fricken clip out! If you can trim the front and back of your video file first, more power to you. It’s best not to be in the middle of a spoken word on the way in and out. That basic level of file prep is probably all you’re ever going to get to. You can create the full-blown director’s cut of your four year old’s adventures when you retire or after his college graduation. I used to scoff at friends who would regularly share their raw smartphone video clips effortlessly from earlier in the day. 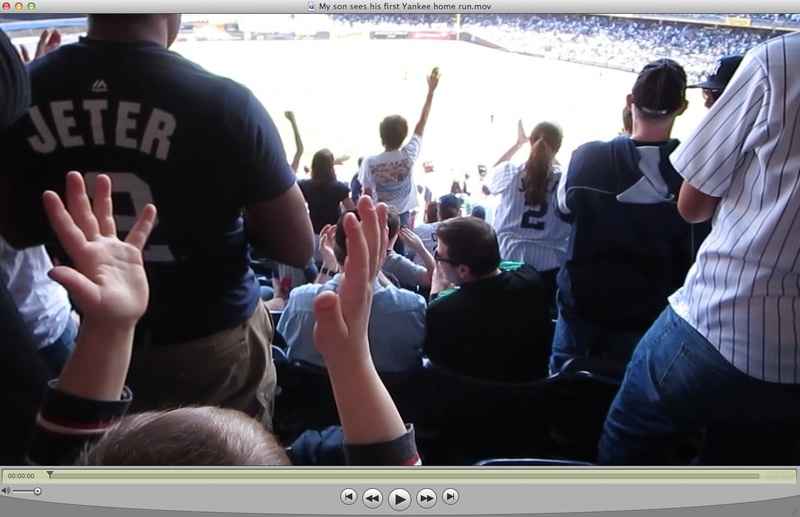 I took a look at some video clips I shot during my son’s first trip to Yankee Stadium last month. Oh, yes… it was an awesome game. These short video snippets from my family’s outing to this classic match up will make quite the fun video. …If I ever get around to editing it. But there’s this one especially wonderful eight-second moment I shot after a Yankee home run. And so did my son. It’s a shame that this little clip has less than a 50/50 chance of ever being seen. If only I could release it, unattached to the larger project I envision. I know… It’s not so amazing. My son watching his first home run at his first baseball game. I feel so much better having done this. …is that really so bad? Probably not. I’m just joining the crowd. But seriously, one solution to help accomplish ‘the dream’ is to set aside one day a month and designate it solely as your media management day. Every other parental responsibility gets put on hold. Maybe a new monthly national holiday designated for parental catch up would be a good idea. That certainly wouldn’t hurt the cause. Until I find the time I need, I’ve signed up to the a la carte video-sharing plan. But how to share the videos? I am trying to figure out an approach to deal with years of clips and wondering if my project should be a dvd, an online archive, a project that just lives on my hard drive? And should it be a single video file for each year or a menu driven interface…? Any thoughts?